Electric shavers provide you with a quick convenient shave, especially when traveling, and in some cases can save you money over the long haul versus razor blades. There are two main types – foil and rotary. Foil shavers tend to get the closest shave, while rotary shavers handle longer hair and the contours of chiseled faces better. Some are only for shaving with dry skin, but there are also wet/dry models which allow you to shave in the shower or with shaving cream. All electric razors may take some time for your beard and skin to adjust to. Experts recommend trying it for a few weeks to let your skin adjust and see how you like it. Most manufacturers offer a 30 day trial period, after which you can return the electric razor if you do not like it. In general the more you spend the better quality of a shave you will get. Prices range from less than $50 to close to $300. You also should take into account the cost of replacement heads and blades, which you need to change every six months to two years. Some models also come with a cleaning system that also requires replacement cartridges, although this option can cost a lot more money. Below we review the top 10 rated best electric shavers. At the bottom of this article we provide a spec comparison chart so you can compare each electric razor model. You might also want to see our Electric Shaving Tips. 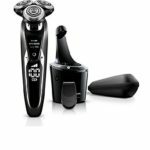 The ES-LV95-S is Panasonic’s most advanced shaving system to date and is the highest rated on Amazon. Most users agree that this foil razor will give you the closest, smoothest shave you have ever had from an electric razor. It features a fast motor with 14,000 cuts per minute, 5 ultra-sharp nanotech blades, multi-flex pivoting head system, an illuminated LCD which shows different functions, and you can use it dry or wet. A one hour charge will provide you with 45 minutes of run-time from its li-ion battery. 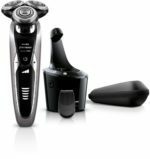 This version comes with a cleaning system, but the same electric shaver without the cleaning system, the ES-LV65-S is available for about $150. At this price, we feel the ES-LV95-S is an amazing value and highly recommend it for all users. 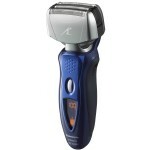 The Braun Series 9 9290cc comes in as a super close second choice for best electric razor. The performance is about equal to the Panasonic ES-LV95-S, but it costs just slightly more at about $230 on sale. 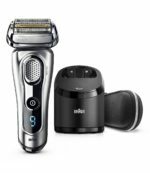 The Series 9 is Braun’s top-of-the-line model which uses 5 synchronized cutting elements and sonic technology to get 40,000 cross-cuts per minute to give you a super close shave. Other features include 10-direction flexing head, 100% waterproof design with wet/dry shaving capabilities, precision trimmer, and 60 minutes of charging provides 50 minutes of run time. It also comes with a cleaning and charging station. Some users actually prefer the Braun Series 9 9290cc simply because it feels more comfortable in their hand as compared to the Panasonic ES-LV95-S, but either way you can’t go wrong. One step down from the Series 9 is the new Braun Series 7 7865cc which sells for about $170 on sale. Unlike previous Series 7 models, the 7865cc can be used for wet shaving in the shower. This thing will give you close, comfortable shave, but maybe not quite as effective as our top two choices. It features pulsonic technology – up to 10,000 micro vibrations a minute, ActiveLift – a patented system that lifts and cuts flat-lying hair, and OptiFoil – the most advanced foil design. The Braun Series 7 7865cc lets you select between five shaving modes ranging from sensitive to turbo. It also comes with the clean and renew system that automatically charges, cleans, lubricates and dries the shaver. If you are looking for a top tier electric shaver less than $200 then the Braun Series 7 7865cc is perfect for you. 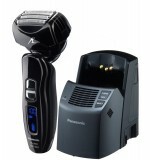 A step down from the Arc5 Panasonic lineup is the Panasonic ES-LA93-K Arc 4 electric shaver. At approximately $133, it is less expensive than the ES-LV95-S, but it is more expensive than other 4 blade Panasonic models. The ES-LA93-K features unique foils each designed to attack stubble in different ways to give you a great shave, although not quite as amazing as the models listed ahead of it on this list. This electric razor is also a wet/dry shaving system so you can use it the way you want. This unit comes with the Vortex Cleaning System which automatically cleans and charges your razor, but if you don’t want the cleaning system you can get the ES-LA63-S, which is the same electric shaver just without the cleaning system. 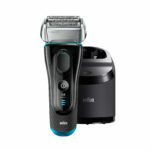 We selected the Philips Norelco Electric Shaver 9700 S9721/84 as the best rotary electric shaver. At around $250 it is expensive, but for anyone who prefers a rotary razor this is the best option for you. Features include V-Track Precision Blades which gets 30% closer in fewer strokes, 8-directional moving heads, three speed settings, click-on trimmer, and wet/dry shaving. The S9721/84 also utilizes a SmartClean system which cleans, lubricates, and dries your shaver. Most people agree that foil electric shavers get a better, closer shave. However, for some people a rotary works better on their face or head – for those who shave their heads. 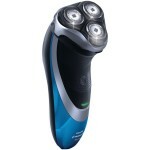 So for those people we recommend the Philips Norelco Electric Shaver 9700 S9721/84. 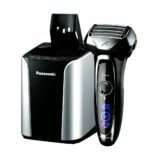 While normally priced around $110, we have see the Panasonic ES-LF51-A on sale for around $80 which would make it the best value electric shaver and the best under $100. The ES-LF51-A does not have the multi-flex pivoting head or the cleaning system like the ES-LA93-K. Otherwise it is very similar including having 4 blades and the wet/dry capabilities. If you can find the Panasonic ES-LF51-A for anywhere under $100 we highly recommend it, because it provides an amazing value at that price for the performance you get. One step down from the Noreco 9700 is the Philips Norelco Shaver 9300 S9311/87 which sells for about $180. This model has an older blade style and does not have the digital user interface like on the S9721/84. However, all other features are identical like the three speed settings and wet/dry shaving ability. Overall the performance difference might not be worth the price difference, so if you want to save some money and still go with a rotary electric shaver then select this Philips Norelco Shaver 9300. The Panasonic ES8243A is our pick for the best electric razor under $100 with a price of $80. For its price you get a quality shave, but not quite as good as the more expensive units. Users on Amazon also really like it with an average 4.4 star rating from over 2300 reviews. The ES8243A is powered by a 13,000 CPM motor and has 4 blades. One feature we like is the turbo cleaning mode which vibrates the whiskers clear while under running water. Users can use this razor as a wet/dry model. The Panasonic ES8243A is getting old, having first been introduced in 2008, but it is still a great deal for this price. The $118 Braun Series 5 5190cc is the third-tier in Braun’s electric shaver lineup. We rank its performance slightly below the Arc 4 Panasonic models. 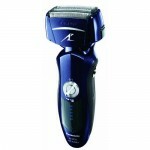 The 5190cc uses 2 foil blades and 1 ActiLift trimmer to cut hairs in different directions. It also is 100% waterproof and features a precision trimmer, 8 direction comfort head, and alcohol based cleaning and charging station. In this price range we prefer the Panasonic Arc 4 offerings, but if you would rather have a Braun foil shaver then the Series 5 5190cc is for you. 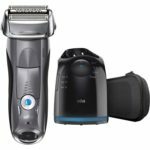 Our choice for the best cheap rotary electric shaver is the Philips Norelco Shaver 4100 (Model AT810/46) which costs about $60. There are cheaper models available, but all of them will leave you disappointed in one way or another. This one exceeds all other rotary’s in this price range, but does have some difficulty in getting a perfect shave around the neck. It can be used dry or wet and is easy to clean even without an automatic cleaner. We recommend the Norelco 4100 for anyone who wants the cheapest rotary shaver they can get. Here are some simple guidelines to follow to get the most from your electric razor. If you shave with your face dry your razor will cut as close as possible. Don’t wash your face before shaving. To get a really close shave, especially if you have sensitive skin, you can use a pre-shave lotion. They let the razor glide over your skin while preventing the hairs from clogging up the motor. Use the proper technique or follow the instructions with each model. In general with a foil shaver, stretch your skin and shave with the grain. Then go back against the grain if you need to get closer. With a rotary unit, you want to shave in small circles. Take care of your razor – for all models you should replace the blades or the rotary heads yearly, and keep it clean between uses. You might also need to put machine oil on regularly.